Festival of Books, the annual extravaganza of all things literary, takes place over Labor Day weekend. The event features a giant used book sale, two days of readings and book signings by nationally known and local authors, a children’s program, and the Cookbook Café, serving fruit snacks, home-baked goodies, and our famous no-alarm vegetarian chili. 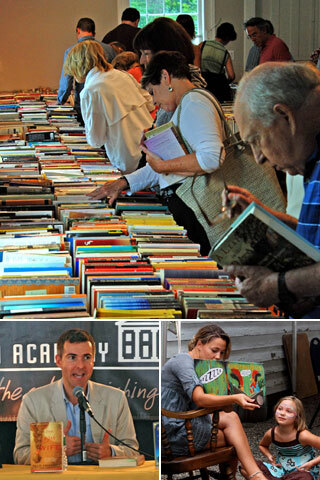 At the heart of the Festival is our annual book sale, one of the biggest in the region, offering more than 10,000 gently used books, including fiction and non-fiction, hard and soft cover —all at very affordable prices. Special sections included the Kid’s Corner for young readers; a media rack full of CDs, DVDs and audio books; art books; and a first-floor gallery featuring a handpicked selection of specialty books, limited editions, out-of-print books, and new books donated by leading national publishers. Click here for the full 2018 schedule. A special section of the literary program is set aside for young writers. Our fourth annual Young Writers contest, open to Columbia and Berkshire County students in grades 9 through 12, will include Fiction and Essay/Memoir sections. First prize winners will have an opportunity to read their works in the author’s tent. Click here for the 2018 winners.